On Sunday, Delhi Times Fashion Week came to a phenomenal end as designers showcased a stunning array of collections in rich fabrics that were edgy, sophisticated and fresh. 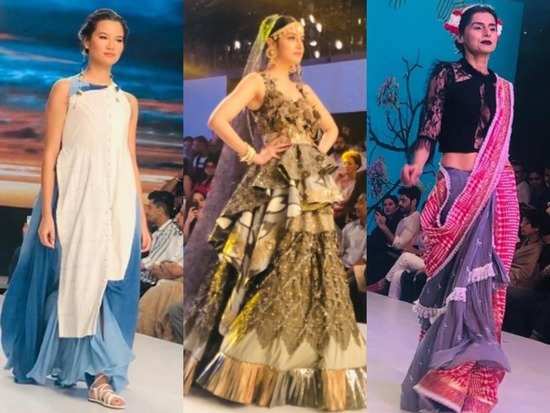 Sakshi Bindra, Neetu Singh, Ritu Beri,Gagan Kumar and Subarna Ray were some of the designers that showcased their extravagant collections at DTFW 2019 on Day 3. Here's a glimpse at what went down at the event. The first show was a collection by Sakshi Bindra who chose gorgeous lace, chiffons and georgettes to create beach wear items and flowy gowns for today's modern woman who loves to experiment. Next up was designer Gagan Kumar, who did not disappoint. The creation had bright colours and sequence work that was inspired by the Rajputana collection. For an extravagant look and feel Gagan used satin, cotton silk, raw silk, pure silk, sambalpuri silk and zari with sequence. For the third show, the students of G D Goenka University showcased various hip and cool designs made with different textures and patterns. Designer Neetu Singh showcased a gorgeous collection that featured multi-panel layering and fine drapes by using organza, net, silk satin and cotton. Sana Khaan turned showstopper at Delhi Times Fashion Week looking glamorous as always. Payal Jaiswal's collection was "an ode to the transformational hues of the sky", which Jaiswal believes is similar to how human nature evolves. Subarna Ray's Spring/Summer 2019 collection was all about summer feels with a collection that was elegant, simple and oozing grace. Designer Ken Ferns showcase a collection that was fun and edgy with a burst of colour. For the grand finale, designer Ritu Beri closed the show with a stunning collection and a fabulous showstopper - Divya Khosla Kumar. Day 1 of Delhi Times Fashion Week was all kinds of glamour and fun! Sonam Kapoor’s opulent white ensemble has a personal detail you may have missed! Day 3 of Bombay Times Fashion Week was a glamorous one! 3Day 1 of Delhi Times Fashion Week was all kinds of glamour and fun! 5Sonam Kapoor slayed in white, *again*! 6Shilpa Shetty’s latest look is proof that Orange is *definitely* the new black! 7Sonam Kapoor’s opulent white ensemble has a personal detail you may have missed! 9Day 3 of Bombay Times Fashion Week was a glamorous one!